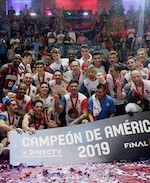 San Lorenzo and Mogi das Cruzes will clash for Liga Americas title in Buenos Aires tonight. They claimed victories in the respective semifinals on Saturday. San Lorenzo cruised past Estudiantes Concordia 101:78. Gabriel Deck (199-F-95) stepped up with 30 points and 7 rebounds to lead the effort. San Lorenzo built a 42:34 halftime lead. They went on a 32:20 run in the third period to clear off for good. Dar Tucker (193-SG-88, college: De Paul) chipped in 14 points for the winners. Anthony Smith (195-F/G-86, college: Liberty) answered with 16 points for Estudiantes. Mogi das Cruzes held off Regatas Corrientes 78:74 in another semifinal battle. Shamell Stallworth (195-SG-80, college: USF, agency: Interperformances) came up with 19 points to lead the effort. Curnell added 18 points and 11 rebounds for the Brazilian squad. Brandon Thomas (198-G/F-84, college: Massachusetts, agency: Interperformances) replied with 17 points for Regatas.